To view all the available rewards, log in or create an account at www.floridacentraldebitrewards.com and click "Rewards". Misplace your card? Get a replacement quickly and easily by calling (855) 341-7667. If you have a Gold or Platinum Debit Card, log in to your account at www.floridacentraldebitrewards.com and click "Shop Online" and "Shop Online Settings". If you have a Gold or Platinum Debit Card, log in to your account at www.floridacentraldebitrewards.com and click "Shop Online". If you have a Gold or Platinum Debit Card, log in to your account at www.floridacentraldebitrewards.com and click "My Rewards Card" and "My Area Deals". To request assistance, please call 855-341-7667. If you have a Gold or Platinum Debit Card, log in to your account at www.floridacentraldebitrewards.com and click "My Rewards Card" and "Rx Savings"
To request assistance, please call (855) 341-7667. If you have a My Rewards Debit Card, sign in to your account at www.floridacentraldebitrewards.com and click "My Rewards Card" and "Hotel/Car Discount Codes". If you have a Gold or Platinum Debit Card, log in to your account at www.floridacentraldebitrewards.com and click "My Rewards Card" and Rx Savings"
My RewardsTM Platinum Debit Cardholders will receive reimbursement for damage to or theft of eligible cellular wireless phones. * This coverage consists of up to two claims per 12-month period of up to $500 per claim with a $50 deductible applicable per claim made. If you have a Gold or Platinum Debit Card, log in to your account at www.floridacentraldebitrewards.com and click "Rewards". 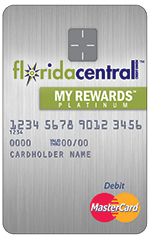 If you already have a www.FloridaCentralDebitRewards.com account, please log in and select Card Settings from the My Rewards Card menu.